Two new albums are out now! 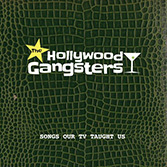 and the first album of the HOLLYWOOD GANGSTERS! Available now from the shop! 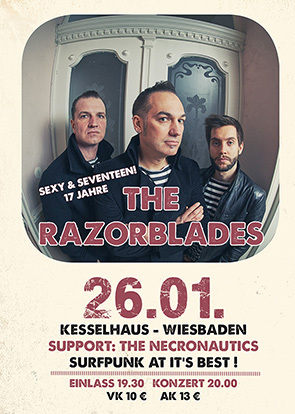 THE RAZORBLADES are taking it slow, playing only a few festivals till September, which gives me the opportunity to do new things..
We're called MR. SMITH & THE JAZZ POLICE and play some of my songs, tunes by Duke Ellington, Julian Lage and some American Standards like Harlem Nocturne, Blue Moon, Sleepwalk and so on. On bass I have my old friend Thore Benz and Ingo Deul takes care of the drums. We're in rehearsing stage, first gigs, website and everything else from the fall on. 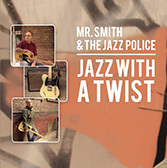 Check out my latest features in GITARRE & BASS. I talked to Ian Ethan, Pete Thorn and some other people. My slide workshop is still running and is now dealing with Lapsteel playing. What else? Gardening season starts soon, mountain biking should be possible in the next days and apart from that I'm stuck in the studio, writing and recording new songs. Tourdates for the fall are coming in, so see you all in October! 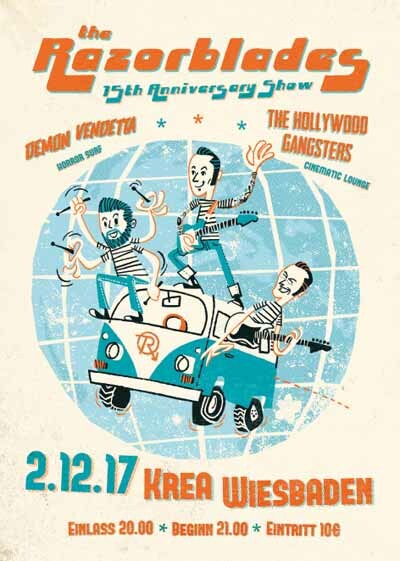 the 15th anniversary show of the RAZORBLADES is coming up! !